I love watching press people at work. Sometimes, I photograph them. 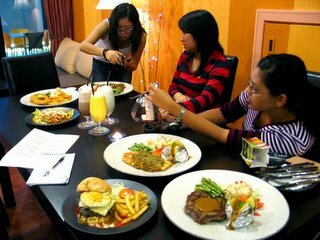 In the above photo, we were at The Crib doing a write-up on the food there. Normally it's just Andrea (far left) and I, but this time we took How Pim (middle) and Vanes (far right) with us. Vanes decided to pitch in with the photography. For our two-page spread, we usually use one photo per dish, or a total of 4 to 5 photos in all. However, you can never take too many photographs. When writing about food, the photos are usually more important than the text. After all, it's the first thing that catches your eye. Yes, we eat all that food afterwards. Awesome, huh? Try doing it for a year without ever being able to work in any regular exercise. You'll start looking like me. the crib’s food is NICE…but the drinks a bit on the expensive side.